Shop Hot Wires Banana to 1/4 Inch Speaker Cables from AMS and enjoy Fast & Free Shipping. Hot Wires Banana to 1/4 inch speaker cables are built with strength and durability to withstand more than everyday use that comes with the music business. These high quality speaker cables are flexible, durable, and provide double PVC insulation for long-lasting life. Hot Wires cables also ship with a Velcro strap. Quality built Banana to 1/4 inch connectors. A Cable To Count On! Hot Wires cables have strength and durability to handle all the abuses that go with the business while delivering pristine, noise-free audio. You don’t have to worry about these cables giving you interrupted sound, static, or loss of quality during an important gig. Hot Wires provide quality sound and construction that you can rely on! 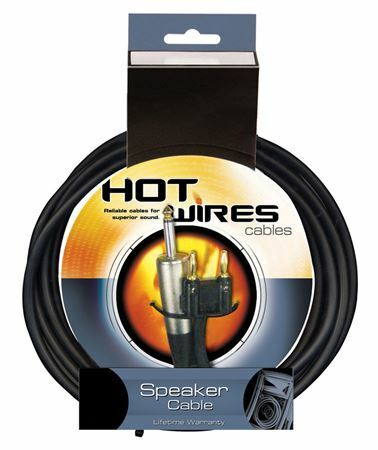 Hot Wires Cables include a Lifetime Warranty!